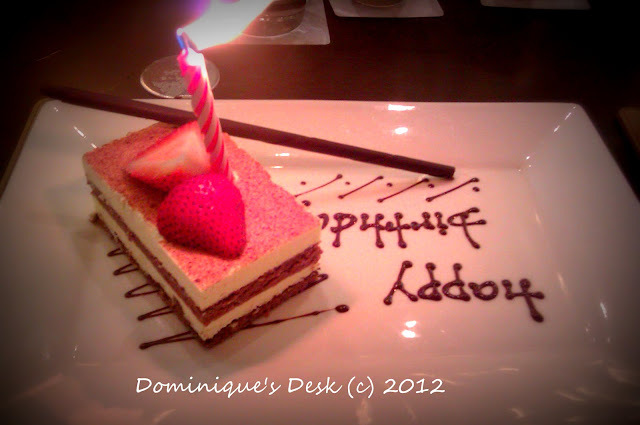 It has been a year since I celebrated my birthday. This year I have been blessed to celebrate my birthday with my girlfriends. In fact the celebrations started since last week when I went out for a lunch buffet with a few girlfriends of mine. I love the slice of tiramisu cake which the hotel kitchen prepared. It was a very generous slice which was presented and I shared with my friends. I had been thinking of making tiramisu and it was just nice that I got to eat some that day. This year I had more celebrations with different groups of friends and had several lunches last week and this week. I will need to work extra hard to cut off all the extra weight that I have gained through feasting and restart my weight lost regime. You must be friendly 🙂 You have different group of friends to celebrate your birthday with. A very blessed birthday to you. Happy birthday dear. May Allah God grant your hearts desire. I celebrated my 31st birthday in the house last year. My husband was away that time so we just stayed home and my mother-in-law prepared sweets. Happy Birthday! I usually make myself my favorite dessert and have a family party. Congratulations – have a great year!!! My birthday is on Saturday–GO LEOS! 😉 Its my first anniversary of my 29th Bday. Hehehe Have a great w/w! Happy Birthday! Happy Birthday Dominique!! 🙂 Have another blessed year! Happy Birthday Dominique! You ish August Babes too! happy b-day! love your cake…yummy! I celebrated my birthday for a month long. With different group of friends. Hope you have a great day celebrating your birthday, Dom! Happy birthday! It’s so fun celebrating our special day especially with food! Yum! I LOVE tiramisu. A very happy birthday to you! Happy birthday sis! More blessings and enjoy your day! Happy happy birthday to you! I love tiramisu. I’m sure you’re tired but happy from all the celebration left and right. I celebrated my birthday last week. I don’t really celebrate anymore but this year I got a birthday cake with a princess theme from Goldilocks. It was for the benefit of my little girl 🙂 Other than that, just church and dinner. My birthdays are HUGE! I celebrate all month. Last year the family went to a restaurant, danced, ate, drank….Heaven! Happy Birthday dear girl! May you have many many happy ones! thanks for your birthday wishes. Happy birthday to you in advance. I’m sure that you will have a really happy day.